You don’t go straight to the top. You have to turn. Copy: When was the last time you saw a bike race without any turns? Probably never, right? Well, that’s a problem for most wheels. See, most wheels use radial-load bearings. The ball of a radial-load bearing sits sandwiched between the two flat surfaces of the bearing rings, creating two contact points along a single plane. Which is fine. If you only ride in a straight line. 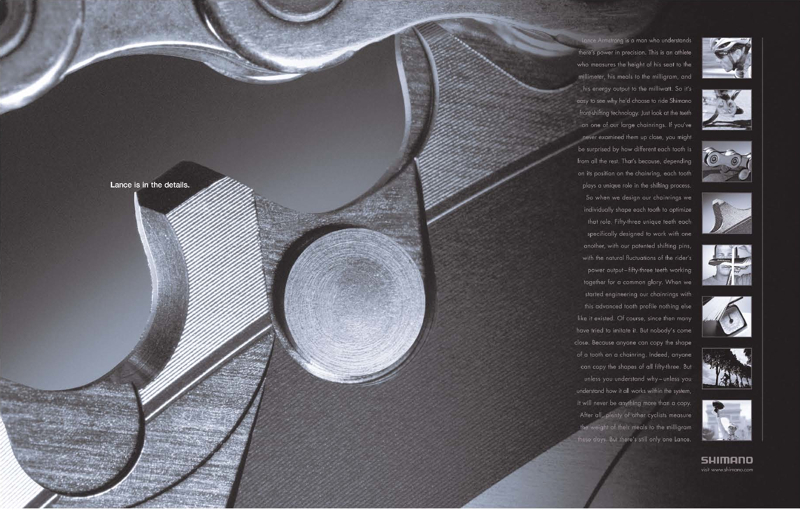 At Shimano, we only use angular contact bearings. The rings of an angular contact bearing are designed to cradle the ball. They account for radial loading, but they also support lateral loading as it’s forced back an forth. And that greatly improves wheel performance and strength in real-world riding conditions. Like, for example, when you’re dancing on your pedals through the Pyrénées. Maybe that’s why more 2005 Tour de France stage winners rode our wheels than any others. Angular contact isn’t the newest bearing technology. And it’s not a proprietary technology. But it’s superior. 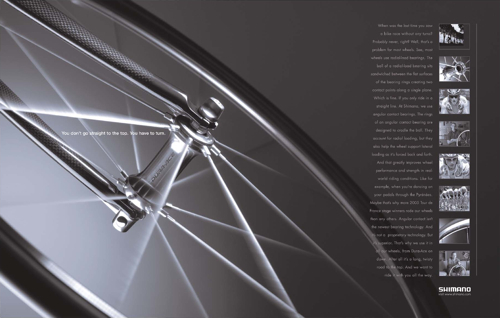 That’s why we use it in all our wheels, from Dura-Ace on down. After all, it’s a long, twisty road to the top. And we want to ride it with you all the way.